At the Walt Disney World Resort only one restaurant can be chosen as "Best Disney World Quick Service Restaurant." For 2010, Only WDWorld awards that lofty distinction to "Wolfgang Puck Express" located in the Marketplace section of Downtown Disney. Wolfgang Puck Express, which was created by Wolfgang Puck himself, serves breakfast, lunch, and dinner, offering a variety of tasty salads, sandwiches, pizzas, pasta dishes, and other signature creations. The Wolfgang Puck philosophy towards his restaurants is that every meal will be a memorable event and a celebration of Wolfgang’s Eat, Love, Live™ (WELL). In keeping with WELL, whenever possible, Wolfgang Puck restaurants offer fresh, natural and organic products from local family farmers and purveyors who further sustainability and the humane treatment of animals. Although this restaurant truly is a Quick Service restaurant where you order at the counter and you food is brought to your table, the quality of the food is well beyond your typical quick service dining experience. As a special bonus it only costs one Quick Service Dining Credit per person to eat here using the Disney Dining Plan. Every so often the menu changes, like it did in March of 2010, but the staples stay the same. 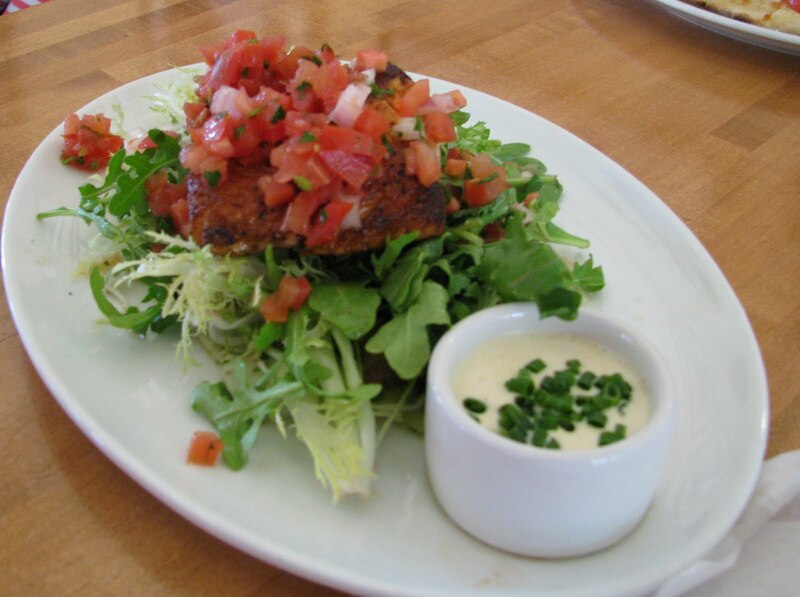 They make wonderful salads, gourmet pizzas, tasty sandwiches, and Wolfgang Puck Signature Pasta and other dishes. The pizzas at Wolfgang Puck Express are wonderful. They are prepared in a wood fired stone oven. The pizza pictured above is the Traditional Margherita with torn basil. After trying several different pizzas on the menu, there really isn't a bad choice. The Pasta Dishes are wonderful and the portion sizes are plenty large enough to have for Dinner. When using the Disney Dining Plan or the Quick Service Dining Plan this is a great option to come to for Dinner. It will be better than some of the Table Service meals that you have. As mentioned above there are occasionally some menu changes. Although a couple of favorite pizza choices are no longer on the menu there are two new additions to the menu that we will mention here that are out of this world. The first is the Oven Roasted Salmon (pictured below). The Salmon is prepared with fennnel, tomatoes, arugula, roasted potatoes, and horseradish cream (on the side). It not only looked great, but it tasted great also. The next new dish was the Bacon Wrapped Meatloaf (pictured below). At first this did not get our attention, but when we saw the dish being served we were blown away. We had to come back later in the week to try it for ourselves. When we tried it first hand, we were not disappointed. 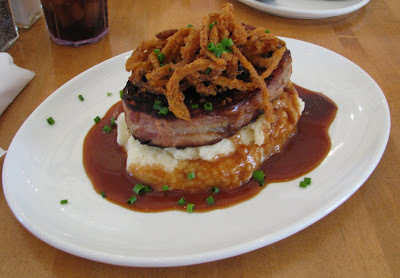 This may be the best Meatloaf meal ever created! The thick slice of bacon wrapped meatloaf is first grilled. Then it is placed upon a generous serving of mashed potatoes. Gravy is added and then it is all topped off with french fried onions. One word to describe it - AMAZING! I never thought I would be tempted to try one of the non-Pizza or Pasta dishes at Wolfgang Puck Express because I have enjoyed them so much, but this Meatloaf is incredible. No great meal is complete without dessert. At Wolfgang Puck Express the signature dessert is the Creme Brulee. The Creme Brulee (pictured below) is very good and highly recommended. You can also get a large cookie or frozen yogurt with your choice of one topping. Wolfgang Puck Express redefines the Quick Service Dining Experience. Once you have dined here using the Disney Dining Plan, you will be trying to rearrange your schedule so that you can come back. If you have never dined here before, you should strongly consider it for your next Disney World Vacation. You will not be disappointed. 1 comments to "Disney World Dining - Wolfgang Puck Express"
Food there is okay when compared to other Disney restaurants. As for the pizzas, they taste like a mediocre version of California's pizza kitchen (if your from up north and love pizza and pizzerias like I am, you are almost certain be sorely disappointed). The meatloaf is also, just okay, definitely not the best I've had. Salmon is by far the best dish on menu, most flavorful too. Would recommend you try it once just to see what the fuss is all about, its decent food at a relatively decent price.